This season, the Quartet invites a amazing trumpet player, Adam O’Farrill, rising star of the New York scene. Random House is still growing with its very melodic and lyrical modern jazz, joyously colored of pop touch but also strongly influenced by the New York school, with very free structures and contemporary colors! 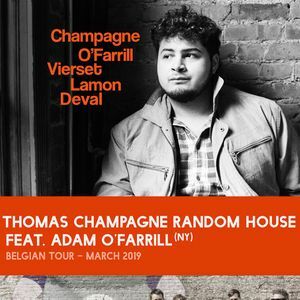 Adam O’Farrill was born and raised in Brooklyn, NY. Born to a deep musical legacy. His grandfather is the legendary Afro-Cuban composer/arranger Chico O’Farrill and his father, the GRAMMY award-winning pianist/composer/activist Arturo O’Farrill! At 23 years old, he’s one of the most wanted trumpet player of the Big Apple. His album “Stranger Days” released in 2016 has been acclaimed by the audience and the press. O’Farrill plays in the Rudresh Mahanthappa’s Bird Calls, (winner of the Downbeat Critics Poll for Best Jazz Album) and Stephan Crump’s Rhombal, along with Ellery Eskelin and Tyshawn Sorey. Adam has also performed with Vijay Iyer, Mulatu Astatke, Mary Halvorson, Steve Lehman, Christian McBride, Jason Lindner, Samora Pinderhughes, Onyx Collective, and more.